Me - My topic for this month is Sabrina the Teenage Witch. There have been many different versions of the show. Most of them are cartoon versions. I like some of them, but I prefer the live action version starring Melissa Joan Hart. It is my favorite show other than Glee and How I Met Your Mother. It is funny and interesting, and I like the plots.I especially loved the episode Pancake Madness. In this episode, Sabrina is not supposed to eat pancakes because witches get addicted to them. However, she thinks she can handle it so she eats them anyway. Then, she gets addicted. She dreams she is in a coffee house with a talking syrup dispenser. The syrup dispenser is trying to convince her to stay there and eat pancakes the rest of her life. It was a really funny episode. Some things, however, don't make sense about the show. In the first season, her best friend was Jenny. Then all of the sudden from the second season on, her best friend was Valerie. It didn't make sense because Jenny disappeared, and they never said what happened to her. So far, I have seen about five seasons of the show, but I plan to see them all. Mom - My topic this month is Annie not the current movie update that is coming out this holiday season, but the stage musical. Annie has a history of breaking little girls' hearts and not only the ones who have never been cast in the show. In the original production of Annie, Andrea McArdle was not originally chosen to play Annie. Kristen Vigard played Annie. She was replaced by Andrea McArdle during previews of the show because the producers felt she wasn't tough enough in the role. In 1989, Danielle Findley was chosen after a nationwide search to play Annie in the sequel Annie 2: Miss Hannigan's revenge. At the time, she was 11 years old. A try-out of the show in Washington suffered through many rewrites and bad reviews. At first, producers were not going to take the show to Broadway but they decided to anyway. However, Danielle Findley would no longer be playing Annie because she was considered too old for the part. She was 12. In 1996, Joanne Pacitti, who was 12 years old at the time, was chosen after a nationwide search to play Annie in a revival of the original Annie. She was fired and replaced with one of her understudies when she contracted bronchitis during previews of the show. Since, she had originally won her role in a nationwide contest sponsored by Macy's. Her parents sued Macy's on her behalf claiming that since she had won the part as the prize winner of the contest, she was entitled to her prize. The matter was settled out of court. In the 2012, revival which closed this past January, Lilla Crawford was cast as Annie. She did go on to play the part on Broadway. The director and the producers of the original Annie, its short-lived sequel and its previous revival were not involved with this production of the show. When my brother was little one day my Mom said to him. "Boy your Dad sure is in love with that telephone." So my brother said "I wish he married the telephone." When my Mom asked why he said. "So that I could marry you." One day, when my stepson was young he asked "If you were going to marry someone else who would you marry?" So I said. "Your daddy. I would always marry your daddy. Why did you have someone else in mind?" Me - Blue Man Group, wow! BlueMan Group was awesome! It is hard to describe. There are three men whose skin is completely blue. They do different things. For example, they play drums. They play with giant phones that are taller than them. The giant phones are called Gi Pads. They paint things. They play with gumballs. Those are just a few examples of the things they do. The things they do they do uniquely and in a fun way. A few times throughout the show, they even pick out people from the audience to participate. The show was so good that I didn't really have a favorite part. I liked it all. It was not like any show I have ever seen before, and I mean that in a good way. The Blue Men are like aliens because they are blue, but they act like little kids because they are really curious. Of course, if real little kids acted liked them they'd either get hurt or get in trouble or both. Still, it is fun to watch Blue Man Group do those things anyway. The show goes by really quick because it was good. It was so much fun to watch. Mom- I didn't know what to expect before I went to see Blue Man Group. I figured how much fun could it be to sit around and watched blue-skinned men for an hour or two. However, I was pleasantly surprised. It was a very entertaining show. The Blue Men remind me of aliens from another planet and not only because of their blue skin. The world and everything in it is a wonder to them. It is like they are discovering everything for the first time, and they take us along on their journey of discovery.We are happy to go because it's a very entertaining trip.The Blue Man are also like great big kids. They don't hold back. They do whatever they want to do. They are curious and have no fear. They don't think before the act they just do. They look at things and react to them and use objects in ways we never thought of before. The performance is so good that you forget there are really real men behind those blue faces. They stay completely in character not only for the whole show but also when they are standing in the lobby having pictures taken with audience members after the show. The fact that are so believable only adds to the enjoyment of the show. I could talk more about the show and get into more specific details, but if you ever have the opportunity it would be much more fun to see it for yourself and be surprised. And that's our view. When is time that you saw a show or something that turned out to be a lot more fun than you thought it would? We were not financially compensated for this post. We received free tickets for review purposes. The opinions expressed here are our own based on our experience attending a performance of the show. Our view: If you want to see something completely unique, we would highly recommend Blue Man Group. Where else can you see a show that involves among other things paint, gumballs, and giant rolls of toilet paper. From the moment, you walk in until the moment, you leave you will be thoroughly amused. In fact, the whole hour and a half show feels like it passes by in an instant. It is that entertaining. We wouldn't recommend the show for very young children and/or anyone who is easily frightened. The show itself is really not scary. However, just the fact that the Blue Men have completely blue skin may be scary to some children who are easily frightened. Children who do not scary easily will love the show because even if they do not understand everything that is going on, it will keep them amused. Children can relate to the Blue Men. They are like big kids.They do things that most kids would love to do, but would get in trouble if they did. The show is very noisy with a lot of very loud music throughout. So, if you are sensitive to noise keep that in mind. However, if you don't mind a little noise and you are looking for a fun time by all means go see Blue Man Group. For more information or to order tickets go to http://www.blueman.com/?utm_source=paid-search&utm_medium=cpc&utm_campaign=paid&cfc_source=search. And that's our view. Tune in to tomorrow's Talking Topics for more about Blue Man Group. 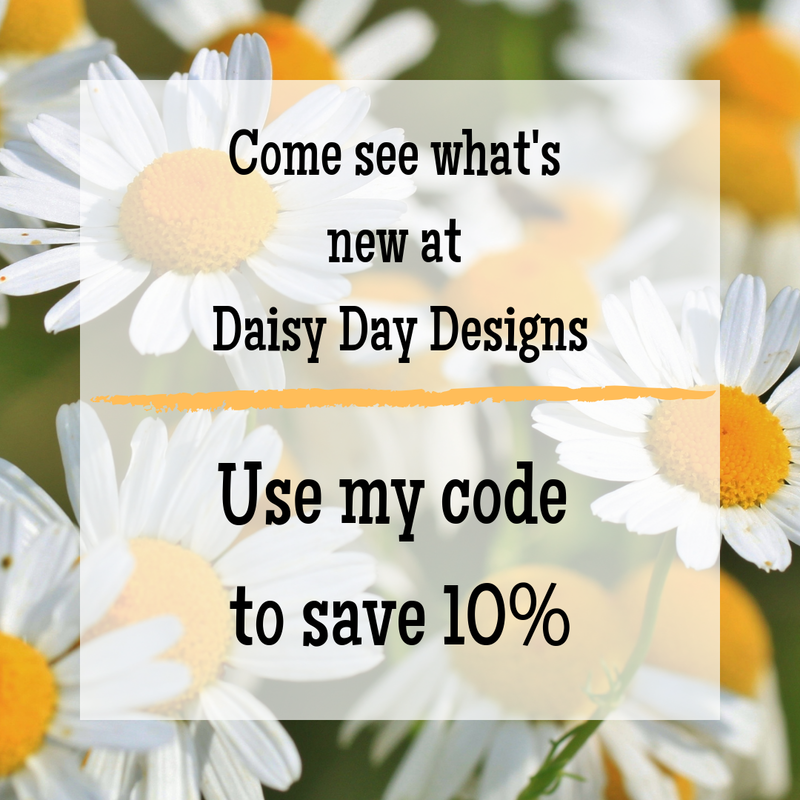 Me- Today I am recommending Hershey's Cookie and Cream bars. They are really good. They taste like cookies and cream ice cream. They are creamier than regular Hershey's. They are really crunchy. They are really crisp. They are yummy! Mom - Today I am recommending Skinny Cow ice cream. They come in a lot of different varieties including cones, sandwiches, and bars. They come in a wide variety of flavors including chocolate, vanilla, cookies and cream, and snickerdoodle. The one thing that remains constant is that they taste delicious. In fact, they taste just as good as most if not all higher calorie brands of ice cream. That is what is so great about them. *The above is guest post by little sister, Aurella, as dictated to Mom. Mom - When I was about 4 or 5, we got a dog. I named him Toto because that was the only dog name I knew at that time. That was Toto 1. He chewed on the furniture. Needless to say, he didn't last long in our house. We got another dog. That was Toto 2. He was a black poodle, but he was kind of an odd shaped poodle. He was not tiny like a miniature poodle nor was he big like a standard poodle. When we got him his original name was Pierre, and he had a sister Babette. We had him for about six years. It seemed longer though especially to my parents I'm sure who were always having to deal with his running away and sometimes his going to the bathroom on the rug and stuff. Also, our dog was an epileptic and sometimes had epileptic seizures. It really scared babysitters when that happened when they were around because they didn't know what was going on. Toto was more mine than anyone else's in the family. He slept on my bed. My brother was very young then anyway, and my sister was just a baby. She wasn't even alive when we first got Toto. We didn't always have to walk him because we would just let him out on a chain in the backyard. Once, when the dog was bad, my mother chained him up in the garage. My father came home and when he lifted the garage door, the dog went up too. My father thought my mother had hung the dog. Luckily, my father put the garage door down, and the dog was all right. Another time, when I was in first grade, my dog followed me to school . It was pretty far though, and you had to cross two major roads to get there including the one that the school was on. My sister used to feed the dog the food that she didn't want to eat at least that is when she wasn't throwing it in the garbage can. If she said, she was done eating we all looked around to see if the dog looked especially happy or if there were any garbage cans full of food. When my brother was little, and we first got the dog, he used to call the dog "the rrr rrr". My cousin thought that all dogs were named Toto because our dog was until he got a dog of his own (well, actually it was more his mother's dog). When I was 11 and we moved to a new town, I was out walking the dog and the girl across the street wanted to introduce me to her mother so she said "This is Dorothy and her dog, Toto." One day, I came home from school the dog was gone. My parents told me they had taken him some place where they take care of old dogs. I was never really sure because I never heard of a place like that. When I asked my Dad about it years later, he still said the same thing. I would like to think that is what actually happened though. In any case, our dog would be long gone by now because that was quite a long time ago. A part of me still misses him just as much as I miss any of the other pets I have had over the years that have since passed on. And that's our view. What is your favorite kind of dog? When Aurella was little, she named one of her dolls Betsy Reason. She said "Everything has to have a reason that's why there's Betsy Reason." When Aurella was little one day she said "For some reason, I have to stand up." So my husband asked her "What reason?" "I don't know." she replied. "What does reason mean?" We welcome you to share you funny stories with us. Tune in Monday for another Talking Topic. We were not financially compensated for this post. We were given free tickets to a Trenton Thunder game. The opinions expressed here are our own based on our experience at the game. Me - Trenton Thunder, wow! Sometimes, I like baseball; sometimes I don't. I like it when my Mom and I talk about the game as we watch it. I also like it when the team we are rooting for is winning. That always makes the game better. The Thunder are not as bad as other teams I have seen this year. At least, they put up a fight before they lost the game we saw. It was a fun game to watch. I like that they play a lot of games between innings where people can win things. I love the bat dogs! They are both so cute! We got to see them up close as they walked by. I like that the Thunder are an affiliate of the Yankees. The Yankees are one of my favorite teams. The stadium is pretty on the outside. Inside it is a lot like other stadiums I have been to. The food is good. I like the burgers and the ice cream. I hope to go to more Trenton Thunder games. Mom - It was a hot day when we went to see the Trenton Thunder play the Altoona Curve. The Thunder lost 9-7. However, despite all that we still had fun. It is always fun to see players who may one day play in the majors. The fact that Thunder players may one day play on the hallowed grounds of Yankee Stadium (even if it is new Yankee Stadium) only makes it that much more exciting. It is also fun to see players who are already in the majors rehabbing in the minors. A lot of Yankee players have rehabbed in Trenton because of its proximity to New York including among others Derek Jeter, Alex Rodriguez and just this season, Michael Pineda. There weren't any current major leagues playing for the Thunder on this day, but that didn't take away from the fun of the day either. It was great to be in a stadium where no matter where you sit, it is not a bad seat, and you are never that far away from the action. It is to fun watch all the between innings games on the field or on the scoreboard. It is fun to see the famous bat dogs, currently, Derby and Rookie. Rookie didn't work that day, but it was great to see him at the park anyway. It was great to spend a fun day at the ballpark with my family. I would definitely recommend it, and I would definitely go back myself. And that's our view. Where does your family like to go together for a fun time? We were not financially compensated for this post. We received free tickets to a Trenton Thunder game at Arm and Hammer Park. The opinions expressed here are own based on our experience at the game. Tune in to tomorrow's Talking Topics where we will be talking more about Arm and Hammer Park and the Trenton Thunder. Me - Today I am recommending Two Broke Girls. It is a really funny show. I like that the two girls are opposites, but they are still best friends. My favorite is Max, the streetwise girl. Sometimes, Caroline, the former rich girl, annoys me. I also like the character of Sophie, their neighbor. She is really funny, and I like her accent. The plots of the show are really funny too. It's a good show. Mom - Today I am recommending Jeopardy. Jeopardy is a great show for people who like trivia. If your house is anything like our house, you will have a great time trying to come up with the answers before the contestants on the show. In our house, however, when we shout out the answers we don't necessarily do so in the form of question like in the actual game. Of course, nobody whether appearing on the show or at home watching it on TV ever knows all the answers, but that only makes it more fun to watch. Sometimes, you can actually learn things you never knew by watching the show. It doesn't even matter if you remember all the new things you learn or not it still fun to learn new things. Besides, maybe, some of the new things you learn will actually stick in your head and provide you with new trivia to stump other people with. After all, the fun of trivia is sharing it with other people and not just keeping it to yourself. That is what makes Jeopardy so fun to watch. Me- Summer , wow! I am looking forward because I want to be done doing schoolwork and even more so homework. Schoolwork is not as bad as homework. I am looking forward to not having to read 30 minutes every day. I love reading but I want to read when I want for how much time I want. Sometimes, I want to pick up a book read one chapter and put it down. Other times, I want to read a whole book at a time. Also, I like to pick my own books and not have to read what I am assigned to read. I am looking forward to going fun places and doing fun things. I am looking forward to hopefully hanging out with my friends more. I am looking forward to having fun with my sister. I can't wait to stay up later. I am looking forward to not having to wake up as early. I am not looking forward to not to seeing my friends every day. I am not looking forward to going to new a school next year. However, I don't have to think about that for a while because I have the whole summer to look forward to. And that's our view. What are you looking forward to this summer. For us, it is not enough that someone is a talented athlete on the field, we care about the kind of person they are off the field as well. We want to root for players who are good people, players who are good to their teammates, good to their fans and most importantly good to their families. Daniel Murphy is that kind of player. Even though professional players often have to miss a lot of important events in their family's lives, Daniel Murphy was not about to miss the birth of his first child. In fact, he missed the first two games of the season so he could stay home with his wife for the birth of his child. A lot of the members of the press gave him a hard time for that. However, we think that it is admirable. We like a player that puts family first, and that is why we are voting for Daniel Murphy as the starting second baseman in the National League in baseball's all-star game. However, that is not the only reason we are voting for him. He is also off to the best start of his professional career including being tied for the National League lead in hits. Thus, it is the combination of his talent on the field and the kind of person he is off the field that makes us want to see Daniel Murphy in the All-Star game. In our minds, he is an all-star in every sense of the word. To vote for Daniel Murphy to play in Major League Baseball's All-Star Game go to this link: http://atmlb.com/1oNQ8pK. You can vote up to 30 times on-line. All fans who select the Mets as their favorite or second favorite team will get a 50% off ticket offer after they vote. iLUMINATE has added Wednesday Matinee performances for the summer. Wednesday performances of the show started on June 4 and will continue throughout the summer. iLUMINATE a show which combines music, arts, dance, and the technologic magic of iLuminate as seen on America's Got Talent is now playing at New World Stages located at 340 West 50th Street, New York, New York. Tickets are $49.99 - $69.99 and are available through Telecharge.com 212-239-6200. A limited number of $26 Student Rush tickets (cash only, with valid student ID) are available at the box office day of performance. If you are going to be in New York this weekend and you want to do something truly special for your Dad give him the royal treatment. Give him the opportunity to sit in King Charlemagne's throne on-stage at Pippin and have his picture taken. This once in a lifetime opportunity is only available this Father's Day Sunday June 15, 2015 to anyone attending the 3:00PM performance of Pippin at the Music Box Theater in New York City. If you are interested in participating in this unique offer, download the attached coupon. For more about Pippin go to our previous posts: http://saysmesaysmom.blogspot.com/2013/11/where-to-go-wednesday-pippin.html and http://saysmesaysmom.blogspot.com/2013/11/pippin.html for further information about this offer go to http://www.pippinthemusical.com/fathersday.php. We got a cat fountain for our two cats. Our cat Callie liked it right away. Our other cat Pippi was afraid of it at first. When Pippi finally got brave enough to go over to it and was about to drink, Callie bopped her in the head, and Pippi ran away. We were at our friends' apartment, and I was sitting in their kitchen petting their cat who was sitting by my feet. Their dog who had been sitting in the living room got jealous and immediately came over and pushed the cat all the way out of the room and into the bedroom. We were not financially compensated for this post. We were given free tickets to iPlay America for review purposes. 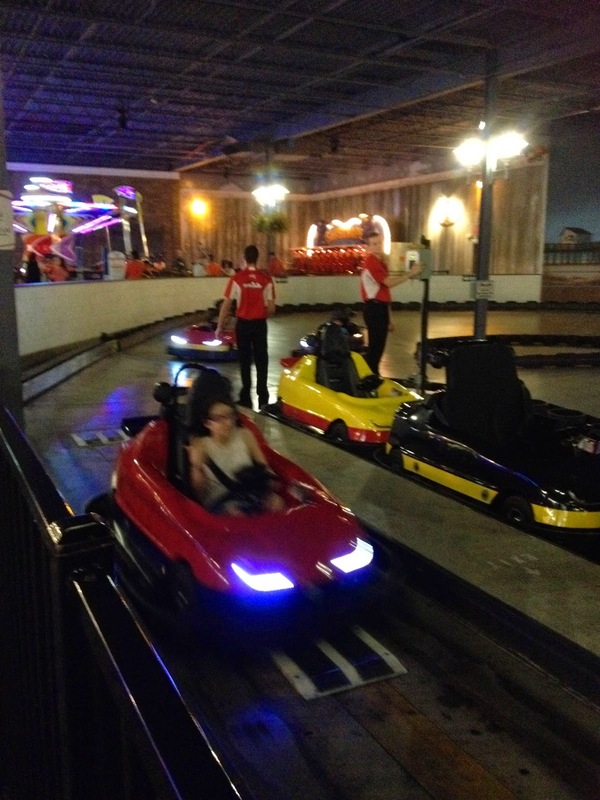 The opinion expressed here are our own based on our experience at iPlay America. Me- iPlay America wow! I love iPlay America. The rides were fun. I only wish there were more of them. I liked all of the rides except for the Go Karts. I think there might have been something wrong with the kart I was driving in. It wouldn't let me steer. It just kept freezing up. 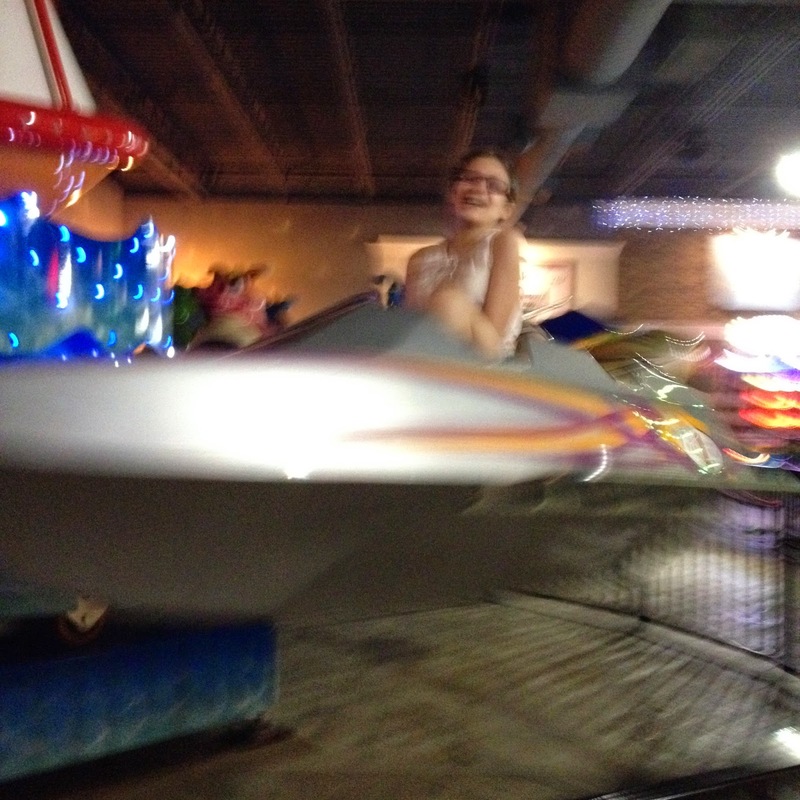 I love the Dizzy Dragons ride. My mom got really sick on the Happy Swing Ride. I loved the Skyscraper ride. That is one of my favorite kind of rides. I am only sorry that they didn't have a roller coaster or a ferris wheel which are two of my other favorite rides. I actually like most rides except Gravitron. I'm glad they didn't have that. Most of the people who worked at iPlay America were really nice and helpful. When I lost my game card, they helped me find it. I loved the games. I am really good at the games. I wish I had realized how many cool claws machines there were before I used up the rest of my money on one. 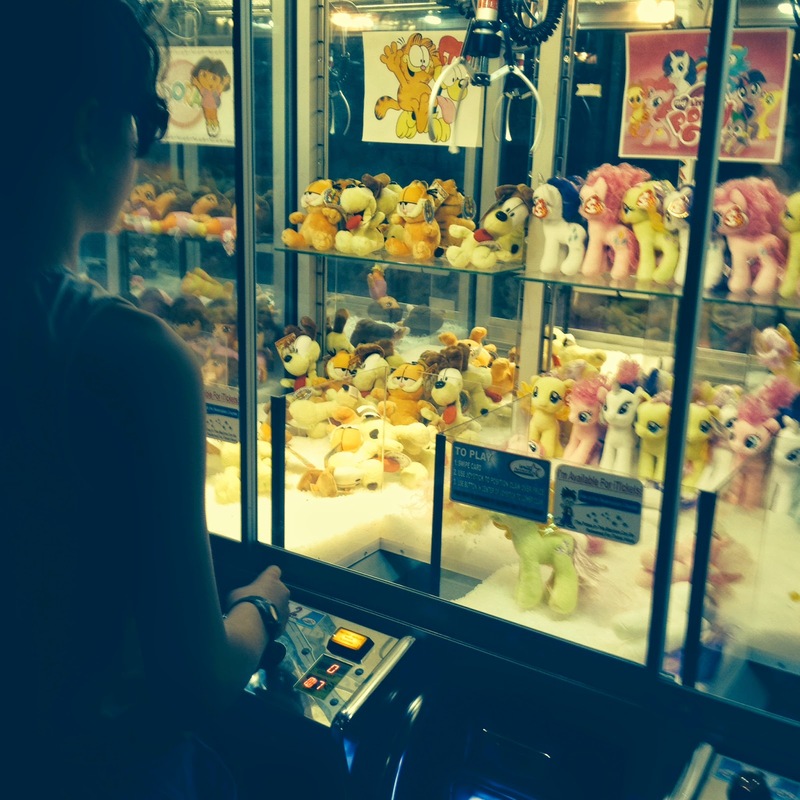 I did manage to win my sister a My Little Pony stuffed animal from a claw machine. 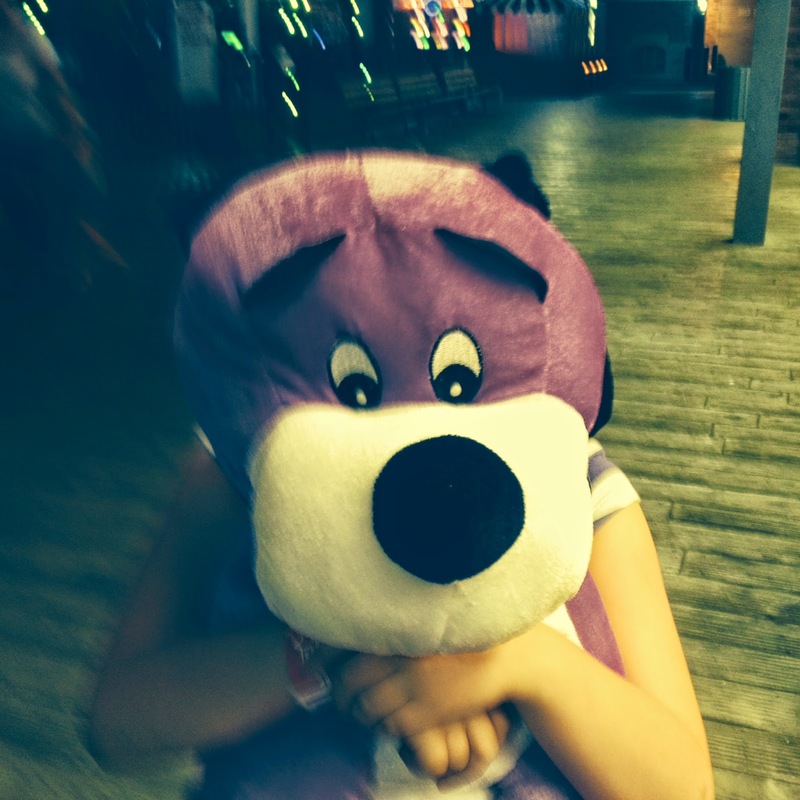 I also won my sister a big purple dog, and I won myself a huge stuffed Walrus playing Balloon Darts. I love i-Play America! It is so much fun, and I can't wait to go back! Mom - iPlay America was a fun place. My daughters both really enjoyed it. All of us except for Aurella, really enjoyed the 4D movie, Toy Store. Melia really loved the rides. 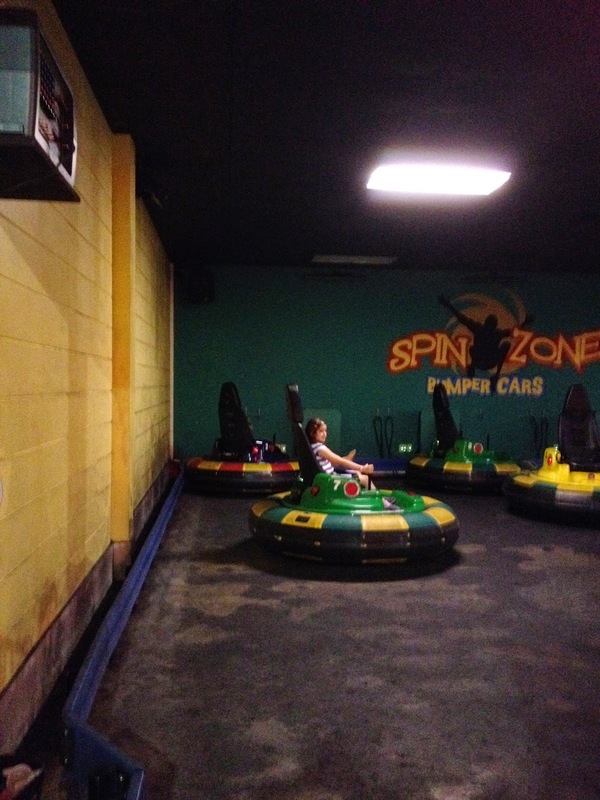 Aurella especially loved the Spin Zone Bumper Cars. At one point, she even went on one herself which is very unusual for her. Even I went on the Dizzy Dragons and the Happy Swing rides. That was not really a good idea, however, since I have really bad motion sickness. Luckily, I did not throw-up. I just got really dizzy and my head hurt so much that when we went out to lunch afterwards I could barely hold my head up let alone eat. 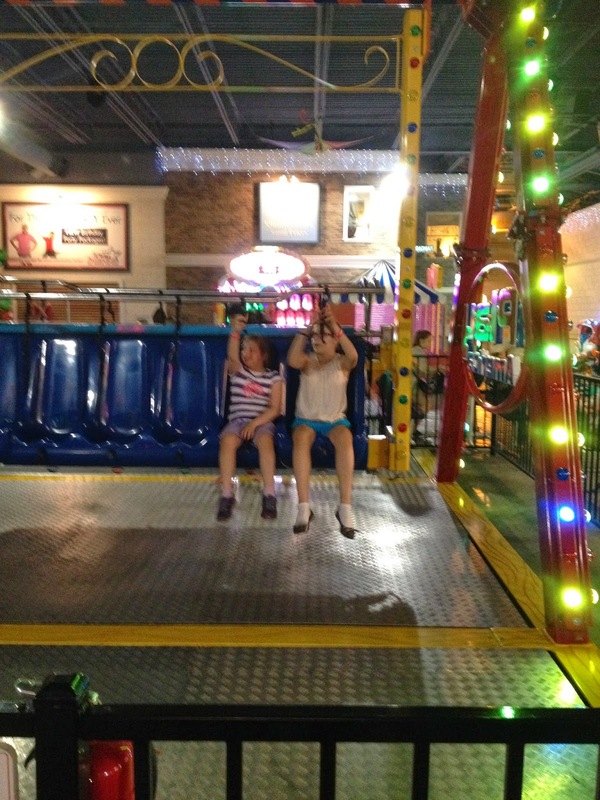 The girls also played games at iPlay America. 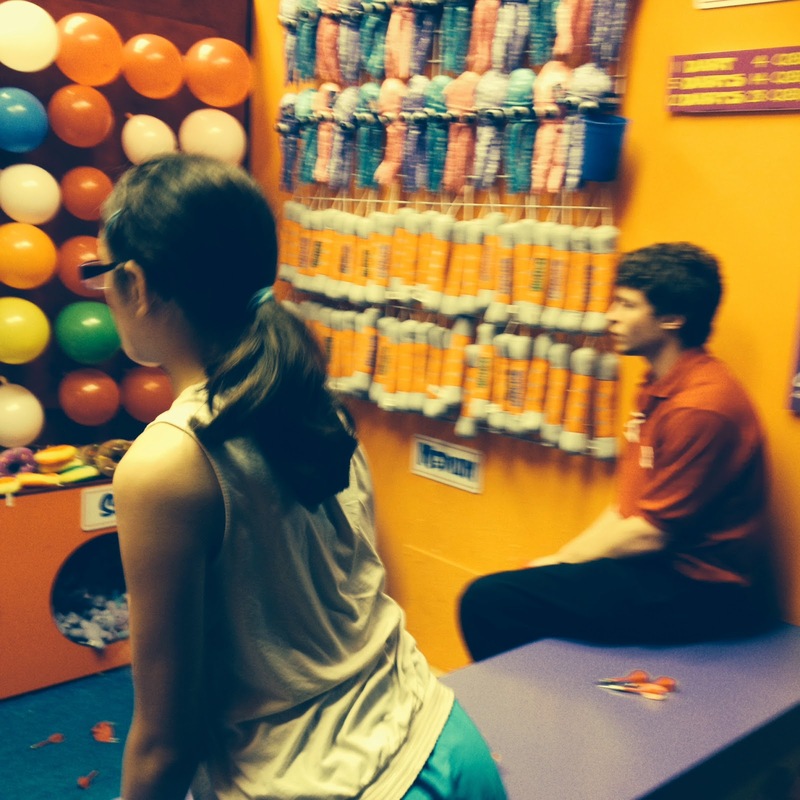 Melia was surprisingly good at Balloon Darts. She won a large stuffed animal for her sister and an even larger one for herself. She also won her sister a stuffed animal in one of the claw machines. 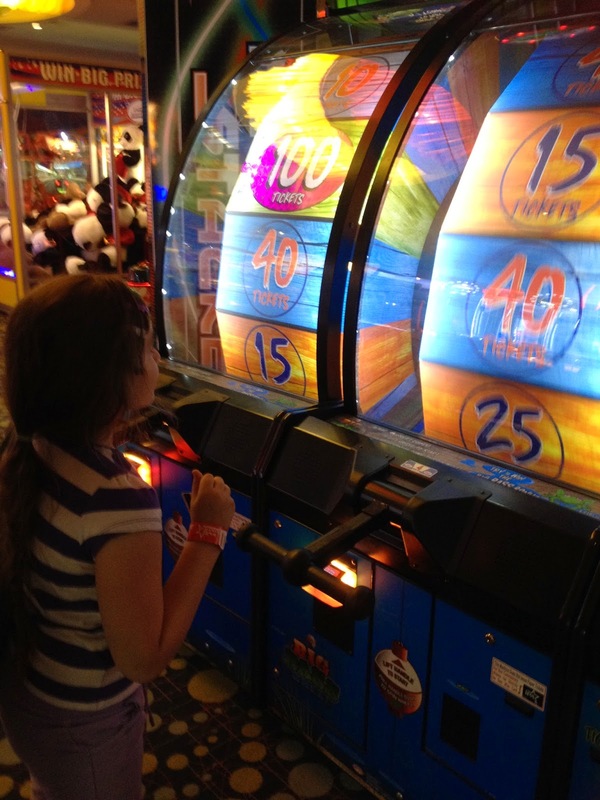 Aurella enjoyed playing a game where she spun a giant wheel to earn points for prizes. It reminded me of the wheel they spin on The Price is Right to try to earn a place in the showcase. Both girls also played Bob's Fishin' Hole, but they didn't like that as much. At the end of our visit, they each ended up with one big prize (both of them won by Melia), and a bunch of little prizes. All in all, they both had a really good time and can't wait to go back. And that's our view. 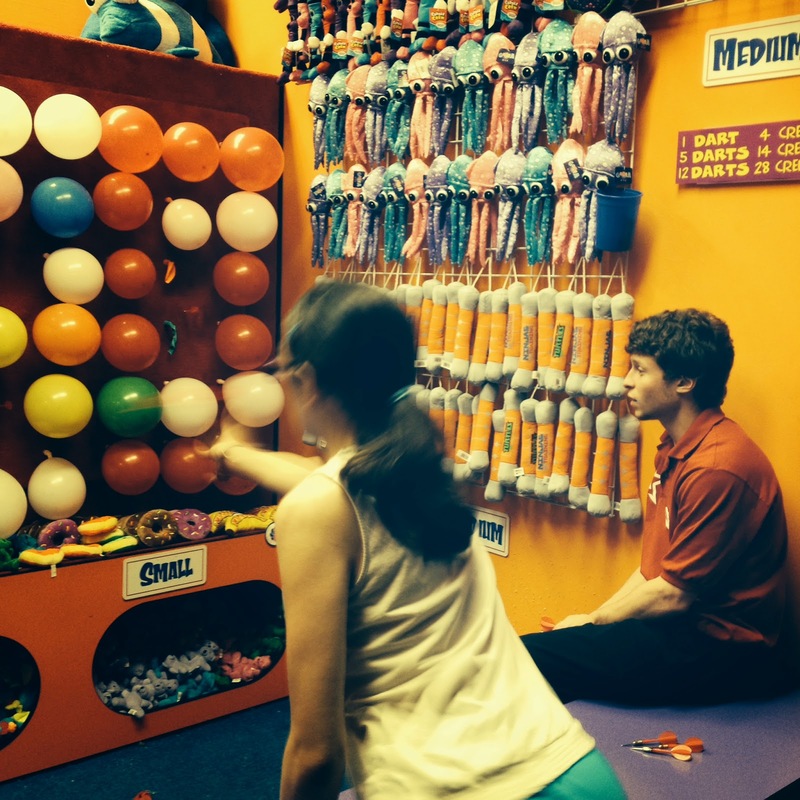 What is your favorite indoor amusement? We were not financially compensated for this post. We were given free passes to iPlay America for review purposes. All opinions expressed here are our own based on our experience at iPlay America. Our view: iplay America is an amusement park and a carnival all rolled into one. It is even better than either of those things separately or together because it is an indoor park so you don't even have to wait for the sunshine and warm weather to go. Any time of year and any kind of weather can be a great day for iPlay America. It is an especially great place for kids who have outgrown Chuck E. Cheese. The games are more advanced. They range from typical carnival type games like Whac A Mole and Balloon Darts to video arcade type games like Pac Man and Guitar Hero. There is also Skee Ball. The rides here are more thrilling than at your typical indoor amusement park. They include bumper cars and go karts. There is also mini bowling, a 4D movie, and Laser Tag. There is also an area for younger children consisting of a soft play area with bridges, crawl spaces, and pads. Even with all that, it is not necessary to carry a lot of cash since all games and rides and other attractions are paid for through the purchase of prepaid iPlay America game cards. Game cards can be reloaded, and they even keep track of any reward points and/or tickets won playing games. 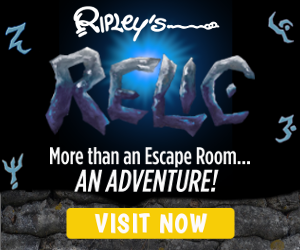 The balance of your reward points and/or tickets can be checked on-line as well as at iPlay America. It is possible to purchase an all day ride pass which also includes Laser Tag. It is not, however, possible to purchase an all day game pass. For more information go to http://www.iplayamerica.com/. And that's our view. Tune in to tomorrow's Talking Topics post for even more about iPlay America. Me - Today I am recommending 100 Pics. I am so addicted to it. The object is to guess pictures. Each game is a different category. You are given a couple of free games, and then you earn coins by guessing pictures in different categories and buy more games with the coins. It so fun! Mom - Today I am recommending CBS Rewards at cbs.com. 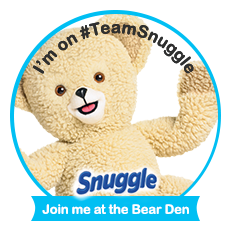 Watch videos, complete challenges, and share content socially to earn coins. Redeem coins for chances to win cool prizes, such as, swag bags related to CBS shows and/or cash prizes. If you like CBS television shows, you will love CBS rewards. For more information go to https://www.cbs.com/user/rewards/login/. Me - Dads, wow! I like my Dad sometimes. Other times, he gets on my nerves. When I like him, he is really nice and fun and gets me things. When I don't like him, he's mean and yells at me and makes me go to my room. My Dad and I don't spend much time together though. Half of the time it's because my sister doesn't let us. The last time I remember going out somewhere with my Dad just for the sake of spending time I was in second grade. I don't remember where we went but I remember getting grilled cheese. At home, he is usually watching TV or on his computer, and when I talk he says "Shh!" Other times when I am with him, and there are other people around, we have a lot of fun and joke around and have fun together. I love my dad. Mom - When I was little, my dad and I were very close. Before I was born, he had been a professional actor. He was in some movies and in the TV series Mr. Novack and in a pre-Broadway show called There Must Be a Pony. Years later, they made There Must Be a Pony into a TV movie. When I was in 3rd grade, my Dad started doing community theater. I liked to go to rehearsals with him and to as many performances of the show as possible. When I was older, I did some community theater too, but not as much as my Dad. I was in a few shows that my Dad directed and we were in a few shows together as well. We also went around to see a lot of shows at ohter community theaters too. Sometimes, my Mom went. Sometimes, she didn't. I mean there is good community theater, but there is also a lot of bad community theater too. My Mom could only take so much of it so a lot of the time I was the one who ended up going with my Dad. My Dad has the best sense of direction of anyone I know. That is one thing I certainly didn't inherit from him. I have a terrible sense of direction. When I was still living with my parents whenever I needed to go any place I was unfamiliar with my Dad helped me figure out how to get there. Now, my husband helps me find places when I need to. He doesn't have as good a sense of direction as my Dad but it is better than mine. Over all, since I got married and had kids of my own, I haven't been as close to my Dad as I was when I was child. I have actually gotten closer to my Mom as I have gotten older. I guess I can related to her better now that I am a wife and mom too. Of course, I still love my Dad too though, and I still wouldn't have wanted any other Dad. And that's our view. What's your favorite thing to do with your Dad? Funny Friday - Where Are My Boobies? When Aurella was little, we were at the pool, and she said "I have boobies." Then, she looked down her bathing suit top and said "Where are my boobies?" Then, she said to her doll. "See my boobies." When Melia started to mature, one day her younger sister said to me "I want to grow boobies too." Me- Old Barracks, wow! A few weeks ago we went to the Barracks in Trenton. British soldiers stayed here even before the Revolutionary War. At first, we saw a movie about the Revolutionary war. Then, we took a tour of the Barracks. We saw where the soldiers slept. We saw their kitchen. There was also a house attached to the Barracks where the officers stayed. The officers had much nicer things. The rooms were bigger. Our tour guide told us about how they lived and what they ate. We saw uniforms and a feather pen. We even saw samples of the food they ate. Most of it was not real. However, there was one kind of hard bread that was real. It doesn't go bad. If you soak it, you can still eat it. That sounds gross to me! Some of the things our tour guide talked about I remember learning in school. They had a really cool gift shop. They had fake Declarations of Independence. They had Colonial papers dolls. They had really delicious candy sticks in several different flavors. I had a sour apple one. It was really good. Aurella had a grape one. She liked it too. For some bizarre reason, another thing they sold was squirrel stuffed animals. There were also a bunch of other things for sale. You should go to the museum because it was fun and you can learn a lot. Mom- I think I went to the Old Barracks when I was in a kid in elementary school so it was interesting to go there again now with my kids. I assume things haven't changed, but truthfully, I don't really remember. Accordingly, I had no more idea of what to expect than my husband or daughters who had never been there before. Both my daughters were sure they were going to be bored out of their minds. We were all pleasantly surprised. The tour was interesting and informative. We were able to learn everything about what life was like for the soldiers who lived in the Barracks. We learned about what they ate. We learned about where and how they slept. We learned about what they carried around with them and how they carried it. We learned about what they did in their spare time. We learned about their medical practices. Our tour guide was very informative and willingly answered all our questions. Her pleasant friendly personality encouraged my daughters to ask a lot of questions. As a result, even though they initially thought they were going to be bored, they both remained involved and interested throughout our visit. They ended up having a really good time as did my husband and I. And that's our view. Where is some place you went where you didn't expect to have as good a time as you did? Our view: At the Old Barracks, you can learn about history in a place where that history actually happened. The Old Barracks housed British soldier during the French and Indian War and the Revolutionary War. While there are parts of the building that have been replaced, much of it has been around since back then. The main part of the building is where the soldiers stayed. Attached to that is a house where the officers stayed. Inside of each are items and furniture that the occupants would have actually used at that time. Some are authentic; some are replicas. It is interesting to see what a difference there was between the two groups from the size of their quarters, to their furniture, to the things they ate. We would definitely recommend taking the tour. The tour guides are very knowledgeable and friendly, and will eagerly answer all of your questions. Anyone particularly interested in history will especiallly enjoy visiting the Old Barracks as may children who have recently learned about the Colonial time period and who would like to see that history come alive. We wouldn't recommend bringing very young children or anyone with a particularly short attention span however, as they would probably be bored. There are also many special events offered at the Old Barracks, such as, An 18th Century Kids Olympics, History Summer Day Camp, and a Fife and Drum concert series. They even host sleepovers for groups of 24 to 30. The Old Barracks is open Monday through Saturday 10-5 except New Year's Day, Thanksgiving, Christmas Eve and Christmas Day. Tours are given every hour with the last tour starting at 4:00. Tickets to the museum are $8.00 for adults and $6.00 for seniors and students. Association members (different memberships levels with different benefits are available for various prices) Active Military personnel and children 5 and under are free. Prices for special events vary. For more information go to http://barracks.org/. And that's our view. Tune in tomorrow for Talking Topics where we will be discussing more about the Old Barracks Museum. Me - Today I am recommending Apple. Apple products are awesome. I love i-Phones. I-pods are awesome too. Apple products rock! Mom- Today I am recommending Just Bead Yourself. If you are in the vicinity of Westfield, New Jersey and you want to make some nice jewelry for yourself or someone else, Just Bead Yourself is the place to go. You won't find any cheap looking plastic beads on flimsy strings here. 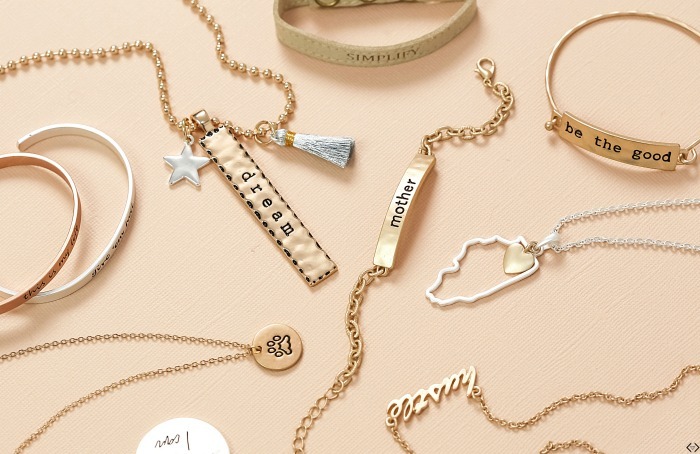 The jewelry you can make is nice enough to look like you bought it in the store. They also do special occasions like birthday parties and girls night outs. 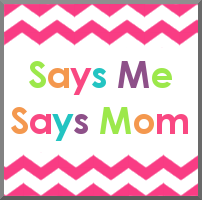 For more information see our previous posts http://saysmesaysmom.blogspot.com/2014/01/where-to-go-wednesday-just-bead-yourself.html and http://saysmesaysmom.blogspot.com/2014/01/just-bead-yourself.html or go to http://www.just-bead-yourself.com/. Me - Dancing With the Stars Season 18, wow! I like Dancing With the Stars. This season was really good. I liked Meryl and Max. I knew they would win. I think they should date. They'd make a really cute couple. I also liked Charlie and Sharna. I definitely think they should have beat Candice and Mark. I also think Peta and James should have beat Candice and Mark too. Peta and James were basically a couple and they are a really cute couple. Candice and Mark didn't deserve to be in the finals. I was glad to see Danica McKeller. I always call her Trudy because that's who she played on How I Met Your Mother in two episodes. My Mom told me she was a regular on The Wonder Years, but I never saw that. I never even heard of it before my mother mentioned it. I have never seen a season where pro dancers Cheryl Burke and Karina Smirnoff got eliminated so early. This was my favorite season of Dancing With the Stars. Mom - I really enjoyed this season of Dancing With the Stars. It was pretty clear right from the beginning that pro dancer, Maksim Chmerkovskiy and Olympic gold medal winning ice dancer, Meryl Davis were going to win. In fact, I don't remember another season where the eventual winners were so clear right from the start since the season when pro dancer, Mark Ballas and Olympic skater. Kristi Yamaguchi won. However, even though at least to me the eventual winners were clear, it was still an exciting season. It was full of romantic intrigue. There were several couples who if they weren't dating in real life should have been. First there was Maks and Meryl themselves. He has always been one of the tougher pros who didn't always seem to get along so great with many of his partners. Since, Meryl Davis is much calmer and quieter than Max, in fact, when she first started skating with her on-ice partner, Charlie White she wouldn't even look at him, I thought Maks would eat her alive. Instead, they were great together on and off the ice. She toned him down. He toned her up. They were perfect together, and they should definitely date. Then, there was pro dancer, Peta Murgatroyd and singer, James Maslow. They were always exchanging looks and one week even kissed as part of their dance routine. Also, I loved Peta's new short haircut. She is a perfect of example of how a haircut can really change a person's looks for the better. It was also fun to see Meryl competing against her on ice partner, Charlie White and his dance partner, Sharna Burgess. It was nice to hear though that as soon as Charlie got eliminated from the competition,he made it clear that he would be rooting for Maks and Meryl for the rest of the season. So all in all, it was a really good season of Dancing With the Stars and not only because of the dancing. And that's our view. What Dancing With the Stars couple do you think should be a couple in real life?